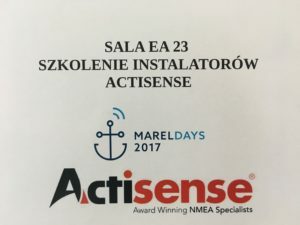 On 8-9 May this year in the Gdansk University of Technology, the first edition of the conference on Maritime Electronics and the Maritime Electronics Days – Mareldays 2017 took place,. The conference was supposed to attract the largest number of professionals and experts in maritime electronics. Thanks to interesting guests and interesting lectures, everyone could find something for themselves. One of the speakers was Actisense, which talked about the NMEA2000®, NMEA0183, and OneNet standards. 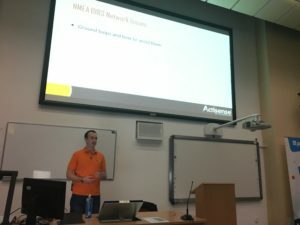 Airmech and Actisense were co-organizer the conference. Thanks to the authorities of the Department of Electronics, Telecommunications and Informatics and Navinord we were able to organize and carry out the first in Europe Actisense Accredited Installer Training. The training was conducted by Actisense representative, Owen Vachell, who is the first person in Europe who received the Advanced NMEA2000® Installer, issued by the National Marine Electronic Association. During training, there was the opportunity to get more knowledge with the devices and to ask questions relating to Actisense devices as well as to the entire NMEA2000® protocol. Participants were given the opportunity to obtain the Actisense Accredited Installer Certificate.